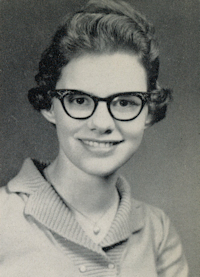 Obituary – Whitchurch, Doris “Christy” (VanBebber) « Perry High School Alumni Association, Inc.
﻿Sophomore Assembly 57-58; Junior Play 58-59; Christmas Vespers 57-58; Red Hots 57-58; Teen Town Council 58-59; Teen Town Clerk 58-59; Teen Town Reporter 58-59; Wrestling Queen Attendant 58-59; Student Council 57-58; Student Council Treasurer 58-59; Home Room Reporter 57-58. ﻿Memorial services will be at 10:30 a.m. Friday at the First Christian church of Perry for Christy Whitchurch, 47, Albuquerque, N.M., formerly of Perry. She died Sunday at Albuquerque after a lengthy illness. A service also is being planned in Albuquerque. The daughter of Glen and Shirley VanBebber, Mrs. Whitchurch was born Oct. 31, 1942. She attended Perry schools and Phillips university at Enid. She and George Whitchurch of Perry were married on April 14, 1961. She had lived in the Belen and Albuquerque communities of New Mexico for a number of years. An employee of New Mexico Title for 16 years, Mrs. Whitchurch was a member of the First Christian church of Perry and later became a member of the Monte Vista Christian church of Albuquerque. She is survived by a daughter, Sherry Gray, Los Lunas, N.M.; a son, Kevin Whitchurch, Belen, N.M.; a granddaughter and grandson, Stephanie and Ryon Gray; her mother, Shirley Morton, Perry; and a brother, Gene VanBebber, Perry.